George H.W. Bush has been called by many the country’s best foreign policy president ever. We’ll look at his legacy on the world stage. PBS NewsHour: "George H.W. Bush: America’s last foreign policy president" — "George H.W. Bush was the last person elected president of the United States with any prior foreign policy experience. "Bush, who has died at age 94, entered office with one of the most impressive resumes of any president, having served as director of the Central Intelligence Agency, ambassador to the United Nations and Ronald Reagan’s vice president. "He left office with an impressive list of achievements, including managing the peaceful collapse of the Soviet Union and the unification of Germany. But a major high point of his presidency was also the harbinger of disappointments to come: the swift military victory that reversed Saddam Hussein’s invasion of Kuwait and seemed to herald a new era in world affairs – but left Saddam Hussein in power. "In 1991, it seemed America could do anything it wanted to in the world. Twenty-seven years after Bush left Saddam Hussein in power, United States forces are still engaged in Iraq, and the US is far less confident of its global role." The Atlantic: "American Foreign Policy Could Use More Prudence" — "During George H. W. Bush’s single term in the White House, the Berlin Wall fell and Germany reunified peacefully. The Warsaw Pact dissolved, the Soviet Union crumbled, and the Cold War ended. The American military ejected Manuel Noriega from Panama and liberated Kuwait from Saddam Hussein. The United States emerged as the world’s preeminent power after four decades of superpower standoff. "This outcome was the product of both long historical forces and key actors, including Ronald Reagan and Mikhail Gorbachev. But it was not inevitable. "As the world order shifted dramatically, George H. W. Bush steered the ship of state with experience, expertise, and—though it launched a million gibes—prudence. America emerged from his tenure stronger than before, with its adversaries weakened or transformed. 'I’m certainly not seen as visionary,' he wrote in his diary. 'But I hope I’m seen as steady and prudent and able.' That oft-mocked prudence was key to Bush’s success." 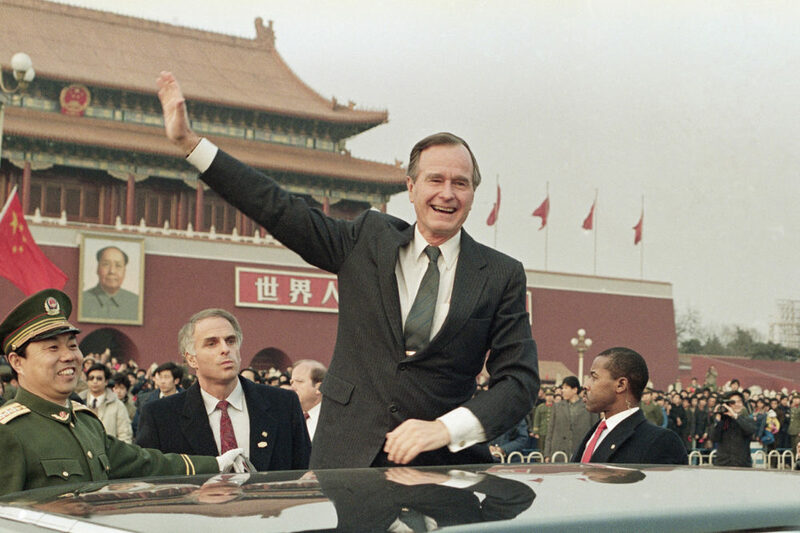 Foreign Affairs: "The Foreign Policy Genius of George H. W. Bush" — "George H. W. Bush entered the presidency better prepared to lead the United States’ relations with the world than any U.S. president before or since. Like Richard Nixon, Bush had served in Congress and as vice president for two full terms. But he had also been the United States’ envoy to China and director of the Central Intelligence Agency. "That experience allowed him to reimagine the way the U.S. government created and implemented its foreign policy. Together with his national security adviser, Brent Scowcroft, Bush fashioned a national security process that maximized internal cooperation and avoided the kind of conflict among senior officials that had tarnished the Nixon, Carter, and Reagan administrations. "That process has stood the test of time. Every president after Bush has embraced the formal process that Bush set out in a memorandum on his first day in office, and every national security adviser has explicitly sought to model his or her tenure on Scowcroft’s example. None, however, has lived up to the brilliance of Bush and Scowcroft."